Oregon is truly a waterfall lover's paradise. What a fantastic time I had with my wife in 2010 when visiting Oregon waterfalls. In fact, I had such a great time that I returned in 2012 with my two sons. The colors ... oh, the colors are so vibrant and alive. The magnitude, height, and sheer beauty of the setting are beyond words. So I will just let the pictures do the talking. Needless to say I highly recommend visiting Oregon. We also made a short excursion to both the Mt. Rainier, Washington area and the Olympic Peninsula and I've listed six waterfalls from that region as well. Below is a list of Oregon waterfalls (and Washington waterfalls) that I visited on my way-too-short trip to the Pacific Northwest. Due to time constraints, etc. I tried to stick to the well known, major waterfalls and ones that require little hiking. Just imagine how many more there are within a few miles hike of the car! As always, each waterfall page will have detailed information (when available) and pictures. The detailed information includes my own personal rating, GPS location, topographic maps, hike detail, and specific waterfall photo tips. I also provide road directions and google map links. There are a few good resources for Washington and Oregon waterfall information that you should know about. Drum roll, please. The website Northwest Waterfall Survey is by far the best online resource that I use. The World of Waterfalls has a very nice section on the Pacific Northwest. The website Oregonwaterfalls.net has many waterfalls for Oregon with good photos and directions. Navigation on the site is only fair. 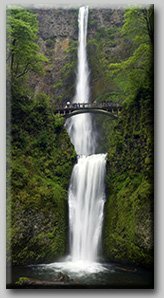 Have you visited a great waterfall in the Pacific Northwest of Washington or Oregon?